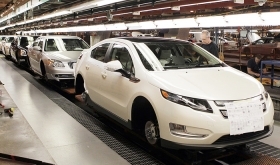 NHTSA doesn't plan to change the five-star crash test rating it gave to the Volt this summer. DETROIT -- U.S. safety regulators have ordered a closer look at the Chevrolet Volts crashed during testing this year as part of a defect investigation into whether the car's lithium ion batteries pose a fire risk after a wreck. The National Highway Traffic Safety Administration is seeking a better understanding of the damage done to the battery upon impact, including how it affects welded materials, according to a memo on the agency's safercar.gov Web site. The request for the evaluation is dated Tuesday, Dec. 6. A NHTSA spokeswoman declined further comment. NHTSA said it has five Volts at its Vehicle Research and Test Center in Ohio, where it will inspect and evaluate possible damage to the battery tunnel on the driver and passenger sides of the vehicles. Any additional testing would be agreed upon at a later date. The agency, working with General Motors engineers, is trying to determine the cause of a June fire involving the Volt. The hybrid plug-in car caught fire three weeks after the agency completed side-impact testing on the vehicle. The Volt caught fire in a storage facility, and the blaze spread to three other vehicles. Further testing during the week of Nov. 14 produced another fire, and the following week NHTSA announced it was opening a safety investigation. According to yesterday's memo, NHTSA is testing for a possible defect that would cause the battery to catch fire after being damaged in a crash. Among the goals, NHTSA hopes "to document if any changes in the welding process are visible at the area of intrusion." GM and NHTSA have stressed that the Volt is safe, and so far, neither the agency nor GM has received any reports of real-world fires involving the Volt. NHTSA doesn't plan to change the five-star crash test rating it gave to the Volt this summer. GM spokesman Greg Martin said the evaluation was just a part of the investigation process. Reuters reported on Tuesday that GM engineers plan to propose several engineering and design changes to the Volt. The proposed changes will be presented to senior management by the end of the week, Reuters said.